Springfield's very own twisted yellow first family is now shown in over 100 countries around the world and has proven to be one of the most successful animated television series of all time. What makes the show so very different from other mainstream programmes is the biting humour and broad appeal to both children and adults. For many, it can be appreciated on many different levels. The success of the show has brought with it an almost Disney sized merchandising bonanza. However, there has been comparatively little discussion or examination of these more often than not colourful collectibles. The Simpsons is a exceptional creative achievement and has reached far beyond the bounds of normal animation with catchphrases and expressions now part of our culture. Cartoonist Matt Groening was the incredible talent behind the project's genesis. He was originally approached to develop an animated variant of his well-regarded cartoon strip called Life in Hell. This was planned to be part of the high rating Tracey Ullman show. Groening offered something fresh and new to protect his cartoon strip if the animated outing was duff. He came I up with a cast of yellow characters and named them after his very own family! His mum Margaret became the long-suffering " large, his father is named Homer, and he ..as sisters named Maggie and Lisa. After 48 Ullman short . appearances, the first half hour show with the K Simpsons, a Christmas special, aired on 17th December, 1989. That was history - now each 20 minute episode of The Simpsons can take over six months to create, at a cost of perhaps $1.5 million. It is a huge endeavor. By 1997, according to the Daily Mail newspaper, global revenue from Simpsons merchandising alone was around $3 billion which can only have risen in more recent years. It is almost impossible to describe the truly vast market there is for fan and collector. It is almost unending and. by and large, colourful and quite affordable. Of course there are a few Holy Grails: like a Japanese lunchbox which has sold for $350! Most of the current collectibles and toys are produced by US manufacturers . The real boom time was 1990/91. In the first season of the show Fox, supposedly signed over 100 U.S. licensing agreements which is quite substantial by any standard. There was as a result, an element of overkill and by the mid 1990s, there were a handful of products to buy out there. 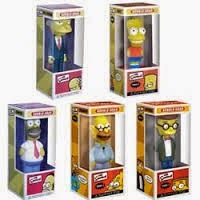 The mainstay of the Simpsons collecting world must be the figures and playsets. Playmates Toys are one of the main manufacturers and are considered by some to have helped revive the merchandising along with Fox, going for quality products. Their 5" figures have been keenly collected ) since they first appeared in 2000. They have covered almost every one of the characters too - over 130 so far! Quite a few have been produced as a mail in only and are even rarer. One of their unique selling points is the ability to take advantage of voice technology with their IntelliTronic system. It makes the figures speak when placed into the correct playset. Talking of playsets - there have been many created by Playmates. My favourite is the Springfeild Main Street set. The display box alone is nearly 20" x 17" in size! 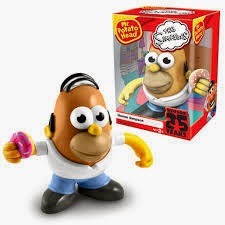 It is an expensive and highly detailed toy with many recognisable features such as Moe's Bar and Lardlad Donuts. It sells second hand for around &80 right now. The values of some of the Playmates items has started to creep up despite not being limited. 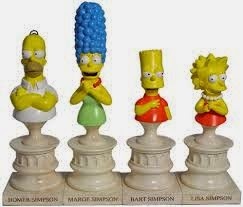 However, the really hot Simpson's figures, price-wise, are the very early ones produced in 1990 by Mattel. In the early days, most of the mass produced merchandise was Bart related. With Mattel's line, the whole family were depicted. Maggie and Lisa are the tough finds and cost$25 -$50 £20 - £35 each today. Mattel also made wind-up toys. As always, mint condition for the toy and the packaging is essential for getting the best price today. 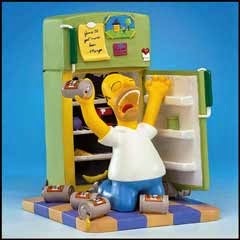 Also, look for limited-edition figures like the 2001 World of Springfield Radioactive Homer. It originally retailed for $10 in the USA but today it can be worth $130. Dolls have also been a mainstay of the business. UK company Vivid Imaginations have been one of biggest producers. The Talking Homer from 1997/8 is an 18" soft toy and trades for around £35 on the net in it's original packaging. The Talking Bart is worth a little less. Both are great toys to look out for. High end prices tend to be for the unique, limited run or one-off items. A good example would be an illustrated script signed by Matt Groening himself. 'H', one of the members of the British pop band Steps paid $4500- £3000 at a charity auction at Planet Hollywood in 2001. By their very nature, charity events tend to see items receive generous bids, but it does give the collector an insight into the type of money required to get into the serious Simpons fan territory. Some of the very finest memorabilia is supposedly kept by Groening himself. On display outside of his office must be the ultimate item of Simpsons ephemera -a framed letter from the former first lady of the USA - Barbara Bush, dated 1990. Bush famously publicly criticised the Simpsons and this letter is part of the correspondence between the show's creator and Mrs.Bush. Later, the Bushes were featured as characters in the show: thev became residents of Springfeild in one most memorable episodes! Each episode of the Simpsons contains about twenty-four thousand individual drawings, or eels. The prices vary but usually £200 - S.350 will secure a fine and authenticated original production eel from the actual show. The size of the image tends to be 6.5" height by 9.5" across. If the, are mounted and framed, they will cost you a bit more. There are plenty of sources on the internet for collectors to acquire them.If the price is a little too high there are also various types of limited edition artwork on offer. There is a particularly buoyant market in good quality statues, busts, 'environments' and figurines. 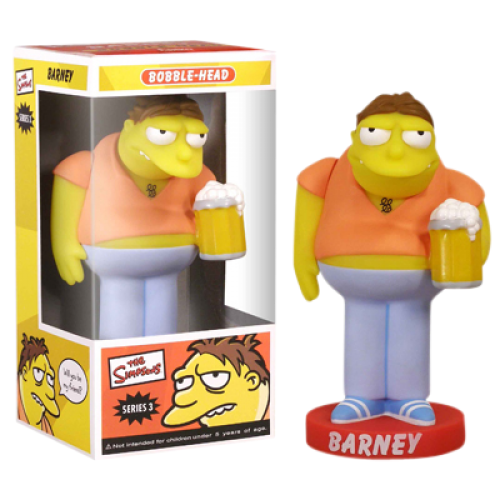 Sideshow Collectables produce the highly popular l/5th scale Polystone busts of the various characters including Homer - usually costing around $50-£30 each. 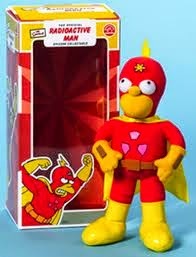 There are also limited edition models which come and go - such as Comic Book Guy. These are good quality collectibles for the fan. 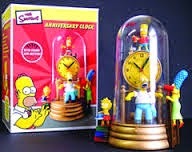 Hamilton Action produce a huge array of different Simpsons statues, again, many of which are limited edition. Called the Springfield Citizens Sculpture Collection Many of these depict scenes which will be familiar to us all - for example, for around$30- £20, you could buy Oh Cruel Fate - a hand- painted depiction of Homer on his knees in front of an empty fridge!